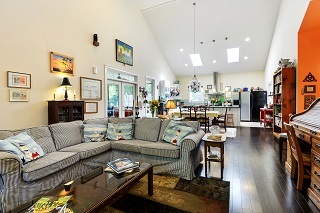 105 Fripp Point Road is located on St Helena Island SC in the community of Fripp Point. Fripp Point Road is easily accessible via Sea Island Parkway, and runs parallel to Coffin Point Road. The community of Fripp Point is a short drive to Hunting Island State Park , the neighboring town of Ladys Island and Historic Beaufort. This gorgeous four bedroom, three full bath home is approximately 2388 square feet and is situated on an acre of land. It was custom built with numerous quality features. It has an open floor plan perfect for entertaining. The eighteen foot ceilings and wonderful depth to the rooms and really opens up the living spaces. 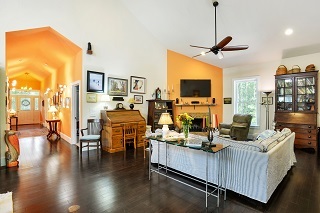 The hardwood floors are throughout the common areas and the bedrooms enjoy plush carpet. The welcoming gallery entry is well lit and is great for displaying artwork or family photos. The living room flows well into the gourmet kitchen. There is an abundance of natural light that shines through from the kitchen skylights. 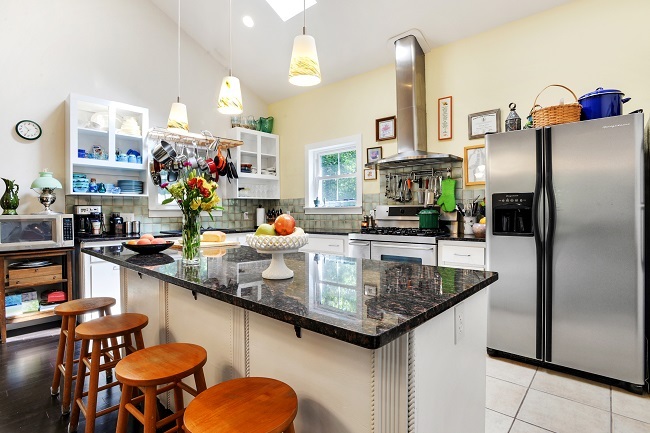 The kitchen is truly a cook’s dream with large island and additional cabinet space. The walk-in pantry has convenient plug-ins for a wine cooler. There are also pull out shelves for easy kitchen appliance storage. The Stove oven is Dual fuel with a gas cooktop and electric ovens. Aside from spacious bedrooms, there are granite counters in both bathrooms, water saving commodes, and beautiful tile. One bathroom is complete with a relaxing Jaccuzi tub and ceiling mounted water spout. 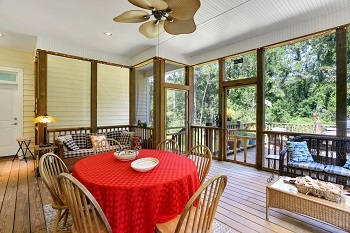 The screened back porch is very spacious and has an additional open deck which is big enough for the grill, additional seating and perfect for outdoor entertaining. There is no shortage of storage space with an attic and a huge area under the house. There is a temperature controlled room under the house that provides outlets for the air conditioner and fridge. There is enough room under the house to park five vehicles aside from the concrete pad off the side of the house. This home was built to be energy efficient. It has styrofoam backed vinyl siding for wind protection, thick 12 inch insulation in the ceilings and floors, with 6 inches of insulation on the walls. The commodes are water saving and the Renai hot water heater is heated with propane. Fripp Point is located on St Helena Island SC. It has a charm all its own. 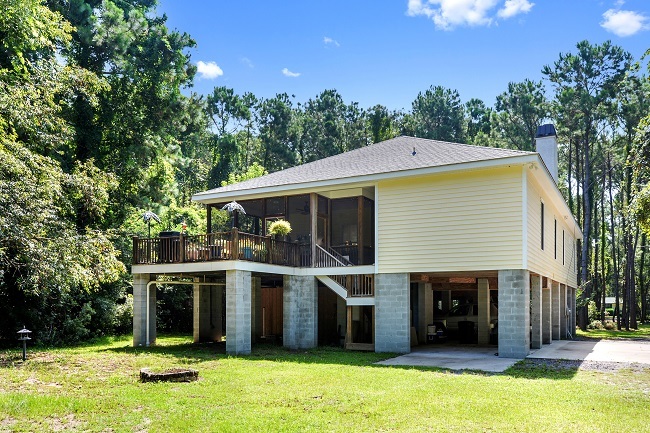 It is located moments away from Ladys Island, Port Royal, and Beaufort. A popular destination for residents and tourists alike is Hunting Island State Park. 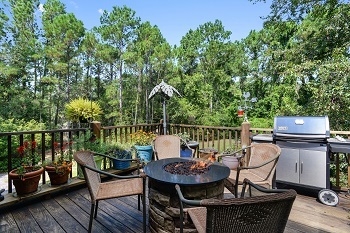 Fripp Island is a resort community a short distance from Hunting Island. 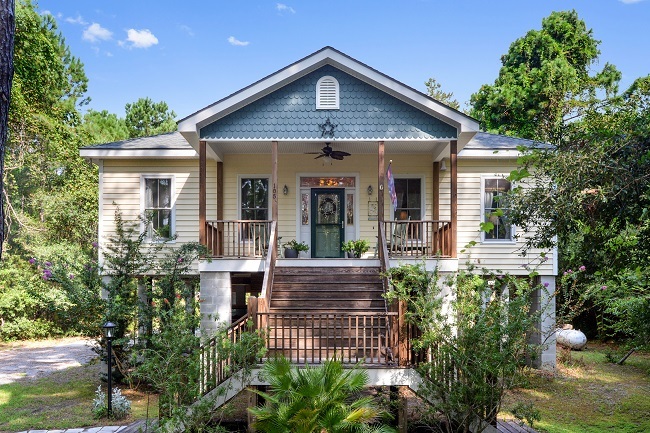 There are various well known landmarks throughout St Helena, which include the Chapel of Ease, the Penn Center, and Fort Freemont (to name a few) and is also known for its deep roots with the Gullah culture.